As a founder of a successful organization that trains and develops sales professionals, Jeff Bloomfield has given a lot of thought to why customers say "yes." 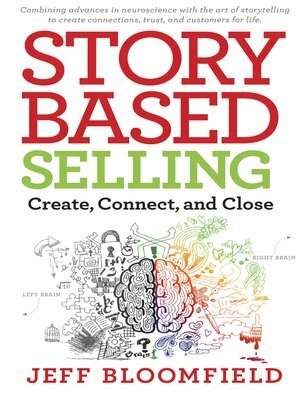 In Story-Based Selling: Create, Connect, and Close, Mr. Bloomfield says it's really no mystery. People buy from people they trust. They trust people they like, and they like people they connect to. And he believes that storytelling is the best way for salespeople—and all of us—to immediately connect to a customer's feelings of trust and liking. He thinks teaching sales professionals to close a deal by presenting their product, probing its mutual benefits, and overcoming the customer's objections and skepticism, is a waste of time. Instead, he urges them to tell a great story. Mr. Bloomfield calls upon the latest research in neuroscience to explain the process of communication. The truth is that during the salesperson's engagement with clients, people quickly base their decisions on how they feel, not the way they think, so trying to persuade someone by first imparting lifeless facts and figures is self-defeating. In fact, this information goes right to an area of the listener's brain (the left brain) that drives doubt and skepticism. To make a deal we need to connect with the parts of the customer's brain that inspire emotions of trust and empathy. By telling a story, we can immediately connect to these good "gut" feelings and drive away the client's fear of "being sold. Mr. Bloomfield tells his own engaging stories while teaching step-by-step techniques of intentional storytelling—to create a fast connection with the listener, no matter who is buying or what a person wants to sell.